“Monday, 10th of May, 1824, probably did not strike contemporaries as especially notable. At the Guildhall Court ‘Eliza Cockburn, a rather interesting-looking girl, about 15 years of age, was charged with attempting to set fire to the house of her master.’ Kean was unable to appear in the title role in Richard III at Drury Lane; but the evening was saved by Macready going on at short notice. Less sensational, but of greater significance for the future, was another event, briefly recorded in The Times on the following day: ‘yesterday, for the first time, the “National Gallery” of Pictures was opened to the public at 100, Pall Mall, formerly Mr Angerstein’s town residence. At present the exhibition consists of these pictures only. It was visited by a number of the nobility and gentry in the course of the day. It will remain open every day.’ (‘The National Gallery: 1824-1974;, The Burlington Magazine, Vol. 116, No. 854, May, 1974). This was the first low-key public acknowledgement in the press of what was to become one of the top five cultural institutions worldwide, the National Gallery. Unlike similar museums in the rest of Europe, the National Gallery was not formed by nationalising an existing royal or princely art collection. It simply came into existence when the British government bought 38 paintings from the heirs of John Julius Angerstein, an insurance broker and patron of the arts. 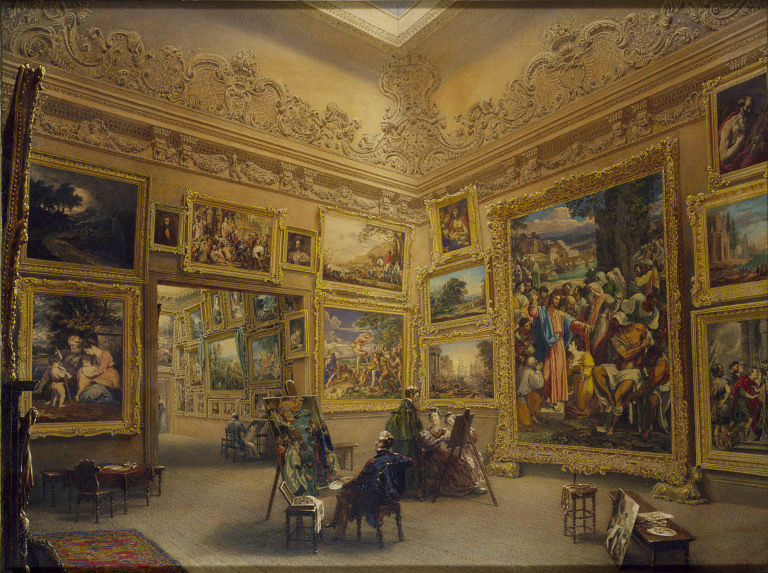 Its first site in 100, Pall Mall was, indeed, as we can see from a 1834 watercolour by Frederick Mackenzie, very small – it shows the room absolutely full of paintings, floor to ceiling. The lack of space caused the founders to move the collection briefly to No. 105 Pall Mall, which George IV had used as an annexe to Carlton House. The novelist Anthony Trollope described this too as a “dingy, dull, narrow house, ill-adapted for the exhibition of the treasures it held”. Dr Waagen of the Royal Picture Gallery in Berlin saw it as having a “dirty appearance … [with] so little light that most of the pictures are but imperfectly seen.” (Taylor). Later in 1938 it was demolished for the Reform Club and the opening of a road to Carlton House Terrace. It became clear that the national art collection could no longer be housed in provisional venues and the state had to provide a designated space in its honour. In 1831, Parliament agreed to construct a building for this purpose at Trafalgar Square, chosen especially for it being situated at the very heart of London. The new building finally opened in 1838, providing a free and accessible cultural bridge between the wealthy West End and the poorer East London. (MacGregor). Its social purpose seemed to be the common denominator decisive in the choice of it location. ‘Cons’ such as central London pollution, or the then still inadequate Wilkins building, were set aside and a possibly more favourable move to South Kensington was dropped in the 1850s, in support of its most significant ‘pro’ : in Trafalgar Square, the national collection could be visited by all social classes, raising feelings of national pride and belonging, and easing lives through aesthetic respite. According to the Parliamentary Commission of 1857, “The existence of the pictures is not the end purpose of the collection, but the means only to give the people an ennobling enjoyment”.(Langmuir). I’ve been in this excellent museum, and I highly recommend it.